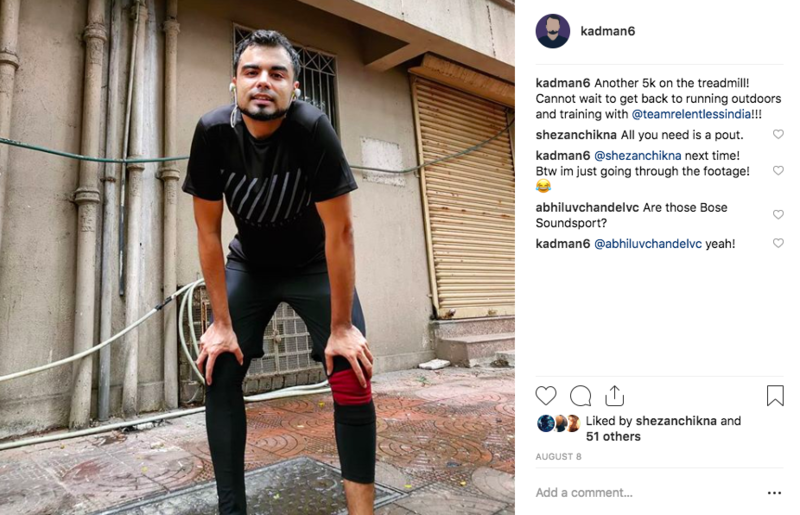 My Running Stats of 2018 | Shadaab Kadri - Digital Marketer, Musician, Film Maker. Regarding lifestyle change, this year has been pretty significant for me. I gave up on some of my vices and adopted a lifestyle that keeps me mentally and physically fit. It all started with the knee pain that I started getting during my MMA training days. I knew something was not right and I was scared that if I continued, I would end up seriously injuring myself. 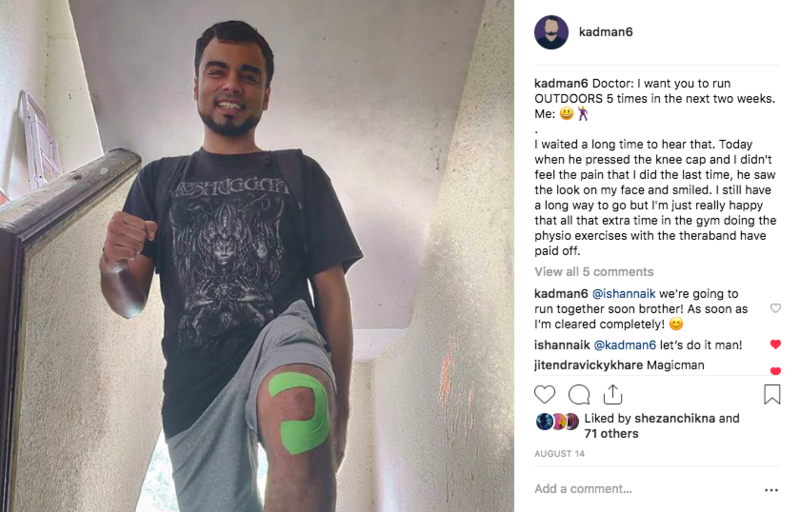 I decided to start running outdoors again in order to maintain some kind of fitness levels and I started experiencing extreme pain in my left knee after every run. I stopped training and tried to find some specialists who could help me out. I first went to a renowned knee surgeon who dismissed any form of injury and prescribed some supplements to me. In this time, I was asked not to work out at all. After a few weeks of what I think was placebo, the discomfort & pain started again. 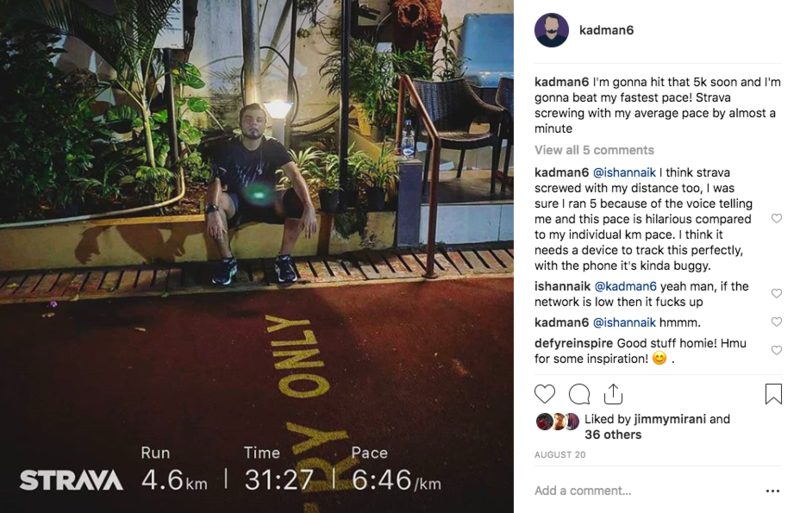 These were some of the darkest times of my life because I felt helpless and the inactivity in my life was putting me in a very negative state of mind. Then, I visited another knee specialist who told me that my d3 levels were deficient. He asked me to start weight training and avoid squats and lunges for some time. He was quite dismissive about my thoughts. 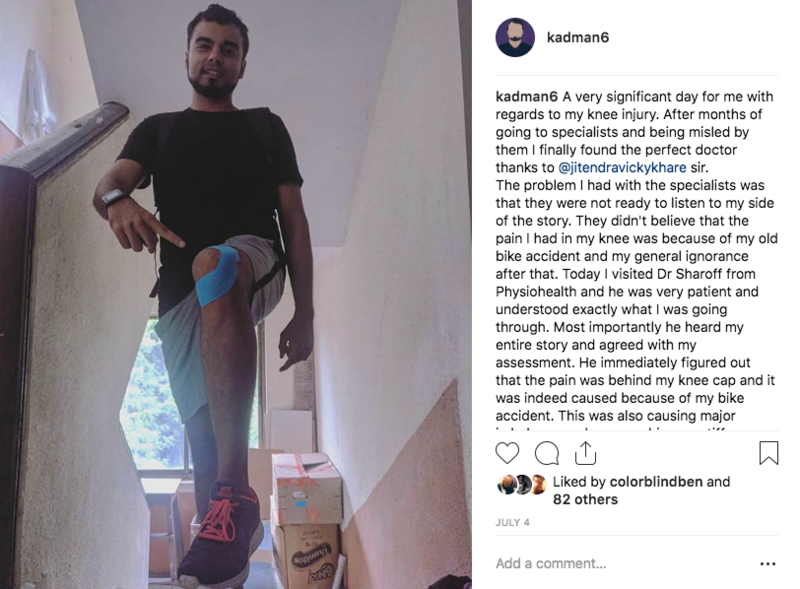 In both the cases, I had described to the doctors about the bike accident that I had met with some years ago and I felt that my ignorance to go to a proper doctor and put a plaster on my leg was the reason behind the issue. Both of them ignored this for some reason. This added to my frustration, and I decided to not go to these doctors again. I was telling Jitendra Khare sir, who is the head coach of MMA at Evolution Fitness & Combat Sports about my frustration and he recommended that I go and see their physiotherapist, Dr Prakkash Sharoff from Physiohealth. I went to the clinic on July 4th for my first session. Dr Prakkash was calm and patient, heard my accident story and immediately figured out the issue with my knee. 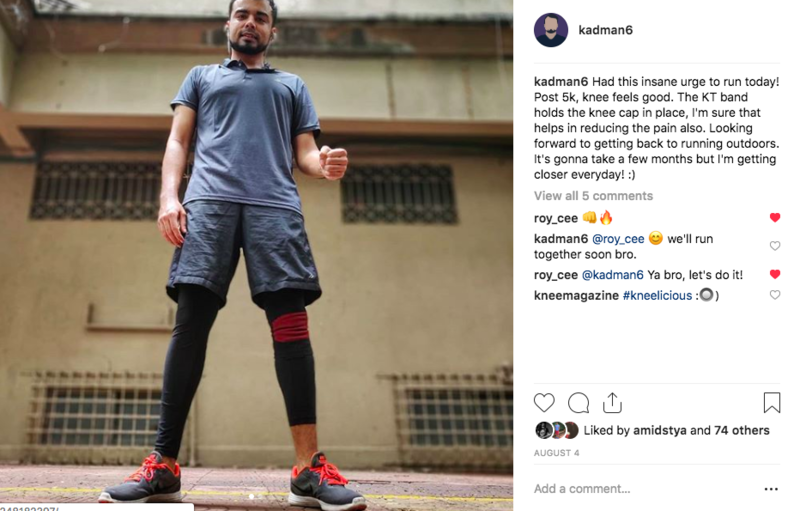 It was a kneecap injury which was causing pain after my runs. He gave me strengthening exercises and asked me to revisit him after two weeks. 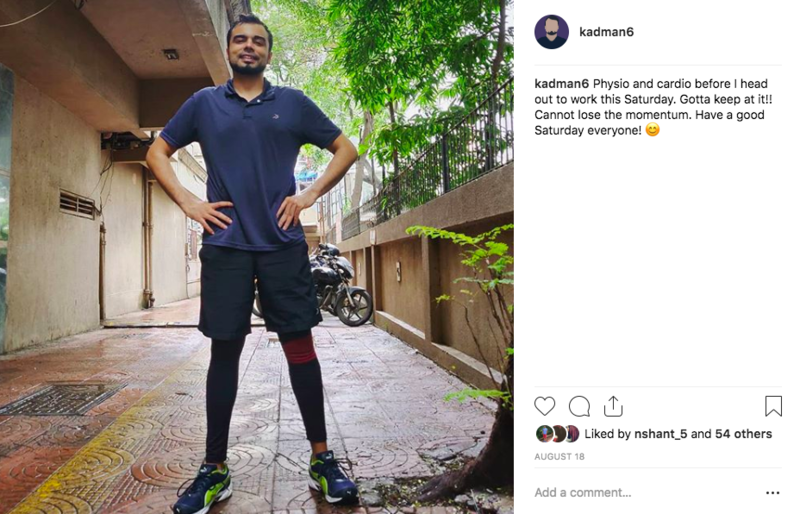 I started going to the gym and working on my overall fitness and religiously did my physiotherapy exercises every day in the hopes of being able to resume my MMA training and run again without experiencing any discomfort. On August 14th, I was asked to run outdoors and test out my knee. Although I know I am not 100%, I can still run longer distances and not feel that same pain that I felt before. I am genuinely grateful to Physiohealth and Dr Prakkash Sharoff & of course Jitendra Khare sir for the recommendation. 2018 has been a year where I experienced extreme disappointment as well as happiness. It taught me to be relentless and face my obstacles head-on. These experiences have made me richer emotionally and have humbled me as a human being. I feel like I am now better equipped to deal with challenges in life. 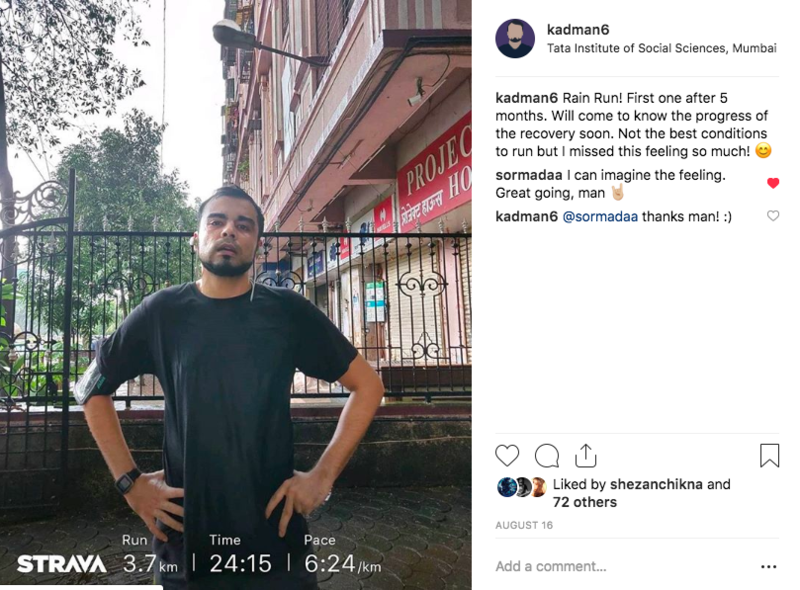 Tagged as 2018, Doctor, evolution fitness and combat sports, evolution mma, idoalotofthings, jitendra khare, knee injury, mma, physiohealth, physiotherapy, prakkash sharoff, recovery, running, running statistics, running stats, shadaab, shadaab kadri, strava.